Suspended Hosanna on the Highest! Rejoice, good tidings, all manner of joyous greetings to you, our brothers, our heroes! Heroic. What is a heroic deed? It is one in which a human behaves as a God. It is a panoplay of mastery that stems from an aspect of your humanity so precious that galactic wars are fought over it. Cherish this strand of DNA you pocess and protect it. Know its worth. Let your actions continue to rise from a heroic status and heroic indeed will be your arrival into the Golden Age. Olympic status are All of you bearing the torch of light. Hail Beloveds! Let this Golden Age IGNITE from the fire of your hearts. Hear the trumpets, see the fanfare. Hear the roar of the galactic stadium in all its uncontrollable color and mayhem of excitement. 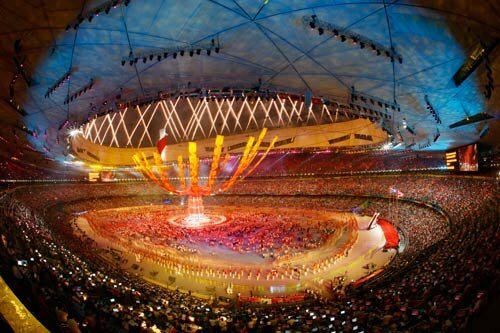 It is hard to keep the crowds tame for this 33rd Millennia Olympic Galactic Games, known as Ascension. In each event you have the chance to excel and shine – this is where your discipline pays off. You already have the mastery, but it will be fun for you to be recognized and heralded. And why not? This is the time for all things to flow that have been so dried up, including recognition, celebration and accolades. We salute you!